There will be some interesting matches to look forward to in the 21st week of the season. 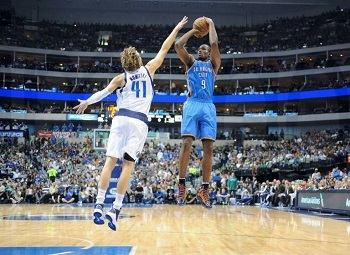 The Dallas Mavericks and their German shooter Dirk Nowitzki have shown not so good performances in the last games and will face Oklahoma City Thunder with Kevin Durant, the Phoenix Suns, Orlando Magic and the highly favoured Memphis Grizzlies. The Mavericks could really use a win in this one for playoff seeding purposes, and maybe they could even get the Thunder out of postseason contention. The Grizzlies are an interesting test for any NBA team currently, because they are one of the dark horses for the title with odds of 13.00. However, the Mavericks have the slight edge in the head-to-head records, having won 27 and of the 42 meetings against the Grizzlies. This might be a good omen for Nowitzki’s team. And the head-to-head statistics against the Magic are also positive with 14 wins and 4 losses. Oklahoma City Thunder will also have to prove themselves against the Boston Celtics and the strong Atlanta Hawks, who are considered favourites in this clash. But the Thunder have Russell Westbrook who can spring a surprise with his dominant game. The point guard has collected his sixth triple-double in eight games and scored 15 of his 29 points in the fourth quarter, helping the Oklahoma City Thunder pull away for a 113-99 victory over the Minnesota Timberwolves on Friday night. The Memphis Grizzlies will face the Portland Trail Blazers with their former German international Chris Kaman in another crunch meeting. The head-to-head record between the two teams is quite balanced. Another interesting match will be played between the Golden State Warriors and the Atlanta Hawks. Both teams have played 18 matches so far and the head-to-head record is evenly balanced, with 9 wins each. The Atlanta Hawks with their German point guard Dennis Schroeder are the current leaders in the Southeast Division, but surprisingly lost their last game against the Denver Nuggets so that the Warriors could take advantage of the situation and earn the victory. The Warriors are the favourites going into this meeting with their top player Stephen Curry who is averaging 23.6 points per game this season. With their most recent victory over Detroit, the Warriors earned their 51st win of the season and they are currently the best team in the NBA with a victory rate of 81%. It will be interesting to see how the Denver Nuggets play against the Miami Heat, the Houston Rockets and the Orlando Magic as they have had a six-game losing streak and fired coach Brian Shaw after one and a half seasons. Brian Shaw came to Denver as George Karl’s replacement and never reached the same success. However, Denver sprung a surprise in their Wednesday game against the Atlanta Hawks and led by as many as 34 points en route to a 115-102 victory. The Rockets will be a tough test for Denver as they are in second place in the Southwest Division and considered one of the favourites to win the NBA title. The last time they played against each other, James Harden scored 28 points to lead the Houston Rockets to a 114-100 victory over Denver Nuggets. We have compared the odds for the NBA basketball league in North America for you. This entry was posted in Sportsbetting news and tagged nba basketball betting, nba odds, nba preview. Bookmark the permalink.